Home › Electronics › Cell Phone Holder For Bike Designed For Iphone (All Generations Including 6+).. Cell Phone Holder For Bike Designed For Iphone (All Generations Including 6+)..
Universal Bike Mount for Smartphones, GPS and Tablets Keep your smartphone on display and within reach. TrueVibe designs productswith active users in mind, providing reliable, easy access to your mobiledevices when you need them most, and remaining non-intrusive when you want toenjoy your surroundings. Our bike holder attaches quickly to most handlebars, holding your phone safeand secured with soft-molded padding. The fully adjustable locking ball-headdesign allows for 360 swivel and tilt to accommodate any viewing angle. Fits ALL iPhone and Samsung models, most Android and GPS. Cradle adjusts from 55mm to 115mm, or open max length up to 3.5 inches. TrueVibe Features: Works with virtually all handlebars Added bands for extra secure grip Soft molded padding to protect your phone from scratches Safely keeps your phone front and center for easy viewing Fully adjustable padded arms with vertical supports Ratchet locking mechanism ensures secure mobile mount with one-touch releasebutton Fits most smartphones, even in a case (OtterBox, wallet style, clip cases,and ornamental cases with uneven surfaces) 360 rotating mount allows for any viewing angle, including widescreen forGPS mapping, video playback, and more... 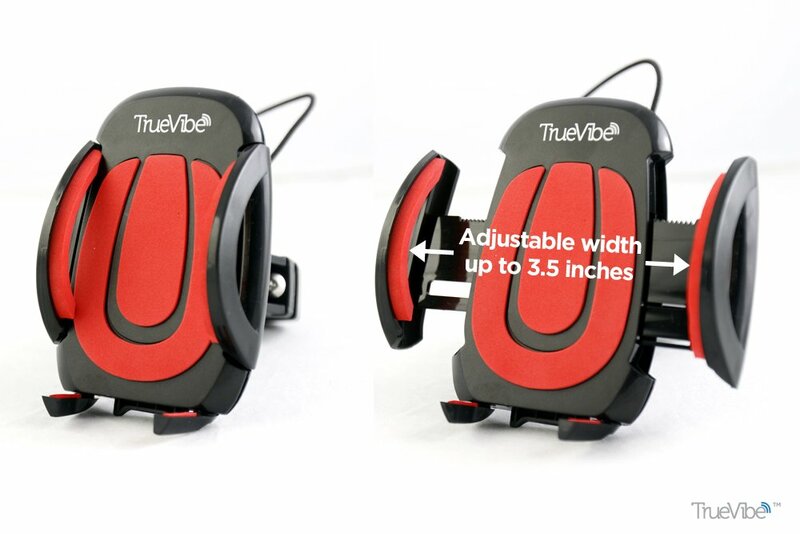 Inside the Box 1 - Cellphone Holder 1 - 360 Mounting Bracket with Mounting Tool 1 - Red Padding with Padded Feet for Extra Stability 1 - EZ Quick-Install Guide in Color with Pictures TrueVibe 100% Satisfaction Money-Back Guarantee. If you are unsatisfied for any reason within 90 days of receiving any TrueVibe product, contact us for a quick, hassle-free replacement or refund! We're having a hard time keeping this bike mount available. Please check backif we're out of stock. To avoid out of stock disappointment, add to cartnow!